Located on Agios Stefanos beach, just 5 minutes from Mykonos town, this modern and elegant Spa resort and hotel offers a breathtaking view of the islands of Tinos and Delos. 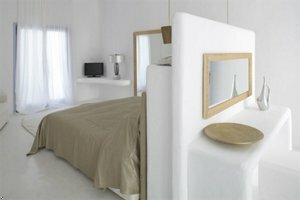 All 38 luxurious rooms and suites are designed in white simplicity. They offer tranquility and relaxation, which can be multiplied by booking spa suites and using the unique in Mykonos and Cyclades in-suite spa services. Touch-screen controllers for hydro-massage and aero-massage will amaze you and enhance your overall satisfaction. Transfers to and from the port or the airport are available, as well as complimentary private transfer services for guests booking a spa suite. The Mykonian Mare Resort is set on a clifftop on the island of Mykonos, Greece, 200 metres from Agios Stefanos beach. 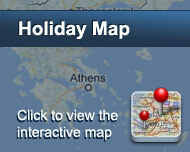 The harbour is 1.5 kilometres from the hotel and Mykonos town is three kilometres away. Mykonos Airport (JMK) is 4.5 kilometres from the airport. Hotel Features. The Mykonian Mare Resort is a domed white complex with traditional Cycladic architecture and modern facilities. The resort offers a steam room, sauna and spa tubs, and a range of therapeutic health and beauty treatments. The seasonal outdoor pool is set on a stone terrace equipped with sun loungers and looks out over the Aegean Sea. Wireless Internet access is available in the resort's public areas. Parking is complimentary and secure. Είστε ιδιοκτήτης ή διευθυντής στο MYKONIAN MARE HOTEL; Εγγραφείτε τώρα για δωρεάν εργαλεία, που μπορείτε να χρησιμοποιήσετε για να βελτιώσετε την καταχώρησή σας και να συνδέσετε την ιστοσελίδα σας και το σύστημα κρατήσεών σας.